These are amazing videos for do-it-yourself wrencher. I have already used them for adjusting the parking brake, engine and transmission fluid and filter change, final drive fluid change, and a DCT initialization process. These videos have already paid for themselves in labor charges and that’s just at 8,000 miles. This is like putting money in the bank! Love these videos! He shoots his videos like I do my maintenance, on the ground with normal tools. I loved the 'tools to have' video also letting me get my toolbox set for tackling my own maintenance. Highly recommend! I think the videos are great. I like the detail of explaining what needs to be done on the bike. Looking forward to more videos. As an owner of prior versions of Cruiseman's videos, I expected quality and accuracy, and I wasn't disappointed. These new videos have more graphic enhancements than prior versions, which added to the clariity of the topics. The detail of each segment was complete, and informative. Anyone competent with a wrench can easily perform these maintenance tasks on their bike. I love the amount of detail in each video. I've been doing the majority of work on my bikes forever, and only wish I could have had videos like these all along. This was a great investment. Cudos Cruiseman! Very good, clear instructions/guidelines for the maintenance. Only 'problem' that I have is that quite a few are NOT valid for the Goldwing Touring de Luxe DCT (with an airbag) as that is the type that I purchased. The comment in the video's to 'purchase the service manual' is a little crude, as the reason for purchasing the video's was that visual representation is a lot clearer that guidelines on paper! Thank you for for your time in making these excellent vids. I’ve viewed all of them and I feel comfortable working on my bike now. Just a suggestion, could you make a video sometime showing removal of instrument lens for polishing or replacement as mine was scratched at time of purchase. The dealer did adjust the price for this appropriately. I am french. English is not my best skill. However, you speak clear and slow and everything is understandable. Thank you very much. I have only watched a few videos to date but I like what I have seen so far. I know they are going to save me a lot of money over the next several years. Good job! Keep them coming! Excellent set of videos that have saved me thousands of dollars between both sets of videos. See article in the January 2019 issue of Southeastern Rider Magazine. Very detailed and clear to the task. The cautions about tabs and directions to pull help a lot. Considering the level of disassembly required to do any maintenance or add-ins, these videos are needed. I chose to download to my pc, rather than using web streaming. I hope you will advise when and if you make changes. I mainly ordered these videos because I enjoy all of Chris' installation videos that he posts for free on You Tube and I know that eventually I will use all of the maintenance videos. Like most guys I am a much faster learner visually than reading instructions and these videos make everything seem like I will have no problem doing them and saving some labor costs. Thanks for everything Cruiseman!! First I want to thank you for taking out the time to make these such wonderful detail maintenance self working videos. They have already saved me so much in dealer cost. I am truly indeed to your hard work. I am look forward to more self help. Thank you so much..
Bought a 2018 DCT and pre-ordered the 2018 On Demand Video Series as soon as they were made available. I have saved the cost of dealership maintenance by watching these videos and doing the work myself. I like these videos because they are practical, useful, and done in plain language. The lighting is good so you can see what's going on, and everything is laid out and spelled out to make it easy for us non-experts. If a person wants to do their own basic maintenance, this is a great way to go. Great set of videos. I was able to change my air filter with no problem at all. I watched the video a number of times as I did the work and it worked out perfectly. I purchased the videos in 2012 and have used them to change fluids, brakes, and to help keep my wing in top shape. I bought this set of 3 DVD's several years ago. I have used almost every segment. They are accurate and easy to follow. After several years of use one of the DVD's got corrupt and quit working. I contacted Chris and he sent a replacement in less than one week, at no cost.. If you don't have these DVD's you are missing out on a goldmine of information. Bike shop hourly rates are outrageous. As a novice in motorcycle repair, I found Cruisman's DVDs invaluable. 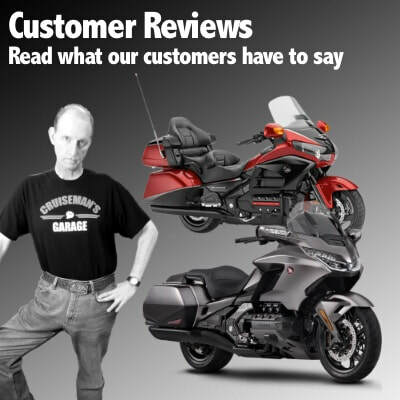 I have used them to change my brakes, replace brake and clutch fluids, air filter and more for my Honda GL1800 F6B Goldwing - no easy task. I have saved so much money and built a personal capability and confidence to take care of all routine maintenance. Great value and I would recommend for everyone. I bought the dvd collection for the 2001-2017 goldwing. I am not one of those "car guys" that started working on cars in their daddy's garage when they were 6. I never took lawnmowers apart like some of my buddies. But, i love working, tinkering with my wing. I don't want to change the engine or anything like that, but the basic stuff, like changing the oil, final drive, fluids, etc., is really a breeze, even for a novice like me. This is a step by step, and we see it done. I bought all the honda books. But they don't tell you "how" to do things....these dvd's "show" you what to do to take something apart (like the top shelter) and how to put it back. This makes it easy.....and you save a few hundred buck from taking your bike to the shop. I wanted at least basic maintenance instructions for routine tasks. This is a great supplemental addition for services I choose to perform. Not to mention any single task pays for the instructional set. These videos and just what a klutzy, non-mechanically inclined guy like me needs. Little things, like "put a rag in the space incase you drop the screw..." are important, because if there's a way to screw up a repair, I'm your man. Thanks for a very valuable product! This video series is very well done. they are very thorough and really help me get through changing the air filter on my 2015 Gl1800. That is the main reason I bought the series. But then I watched how to change my brake and clutch fluids and was able to do that as well. These two alone saved me money over shop labor rates. Plus I now know much more about my bike. The videos gave me the confidence to do it myself. Never had done any maintenance before ordering these videos. Now I just watch one and follow along as I do my own bike maintenance. Easy to follow and clear views and explanations of the work being shown and the tools needed. great purchase. I've had my dvd's for a few years now and I love them. My 08 has 100,000 miles on it and the videos have guided me through many maintenance procedures. They're professional quality make them a joy to use really, and they've paid for themselves many times over. They're clear and concise and make the tasks much less daunting than they may have been otherwise. Anybody that wants to do their own maintenance should have this tool in their arsenal. I purchased these videos to work on my 2012 GL 1800. It has save me thousnads of dollars. I do the oil change and the by itslef has saved me about $100 each time. Last year I changed the air filter, rear brakes, flushed and installed clean coolant fluid, changed spark plugs installed LED high beams, all in one day. It was slow work as changing the air filter is time consuming but I am glad I did it. Not only have I saved a lot of money, but working on my bike has helped me learn more about it, understand its components and has made me more comfotable with it. I bought the DVD's but soon learned that when working in the garage it would be better to have the Videos on Demand as one dont often have a computer in the garage. Non the less I highly recomend these videos. I have also changed ALL of my lights to LED and the videos were great help. I have accomplished much and it sure feels good when the job gets done, I feel pride that I can do it myself and put the money I have saved into more add ons for my bike. Thank you Cruiseman! Found these DVDS to be one of the best tools I have. Have always been a hands on type and these let me set next to bike and do things step at a time. It's like having a buddy there that's done it before. I love your video's for the simple and/oor complex ways to work on the Goldwings. I do my own maintenance on my two wings. The video's gives me in-site to the complex nature of the wings. THANKS for making the video's. I just spent almost $1K for my 24K mile service, which includes replacing the oil filter, air filter, spark plugs, brake fluid, clutch fluid and coolant flush. I wish I ordered these videos earlier...he makes the job look so easy. I'm now inspired to work on my own maintenance in the future. I'll be replacing my own brake pads soon. It would be nice if a video was added on how to remove and reinstall the front and rear wheel while the bike is in its center stand for a 2012+ GW. Thank you Cruiseman!! Well done. Very easy to understand, and very deep into the explanations. You can really learn how to do on your goldwing.